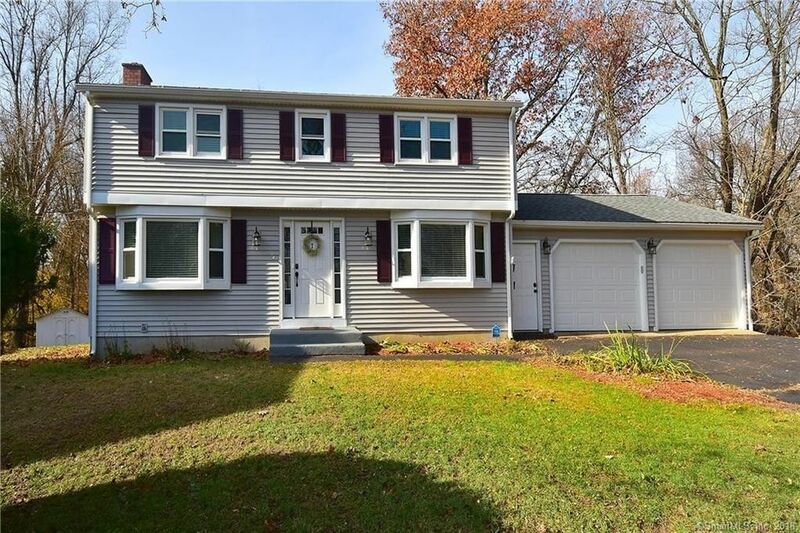 Completely remodeled, open floor plan, updated colonial with private yard at end of culdesac backs to town owned land. 1st floor repainted in pale gray tones with white trim. 18x16 spacious family room steps away and open to kitchen with sliders to the patio. Brand new black stainless steel appliances with white cabinets. The living room offers a cozy sitting area with fireplace for the chilly fall evenings. Full 1st floor bath is new remodel with access to back yard. Flooring on 1st floor is durable laminate tile, easy to take care of and hard to scratch! Oversized 2 car garage as well! Upstairs there are 4 bedrooms with a fully remodeled bath. Other special upgrade include a new 200 amp electrical panel, architectural roof, siding, and windows. This home is in a convenient yet quiet area. Close to shopping and the highway, its an easy commute to the Hartford Springfield areas.Natural gas heat, hookup for gas stove, city water and city sewer. Come view this gorgeous home!